You may not know that it took Einstein 14 years to become known the world over. Even his four ‘miracle year’ papers in 1905 weren’t enough on their own. If you’re involved in the communication of science or engineering, here are key lessons to be learnt. Lesson 1: Evidence is important, but it doesn’t have to be comprehensive. The Special Theory of Relativity attracted interest from the physics community but little interest elsewhere. For more than a decade it was just a thought experiment, a mathematical argument. It had no chance of being tested because it concerned objects moving at or near the speed of light. When Einstein finally cracked horrendous calculations to include gravitation—the 1916 General Theory of Relativity—experimentation became possible. Britain’s Astronomer Royal proposed an experiment during the total solar eclipse of May 29, 1919 off the coast of West Africa, the first chance to observe starlight passing close to the sun. The General Theory proposed that the large mass of the sun warps space in its vicinity, dispensing with the conventional understanding that space and time were absolute. Einstein predicted that the starlight would be deflected by 1.74” (less than one thousandth of a degree), double the Newtonian prediction. In your own project, think of evidence gathering much like a minimum viable product. Initial results may be enough to start many helpful discussions, and even lead to further evidence gathering through your network. Lesson 2: Narrative can make all the difference. When The Times published the story a day later on page 12, the language made all the difference: “REVOLUTION IN SCIENCE. NEW THEORY OF THE UNIVERSE. 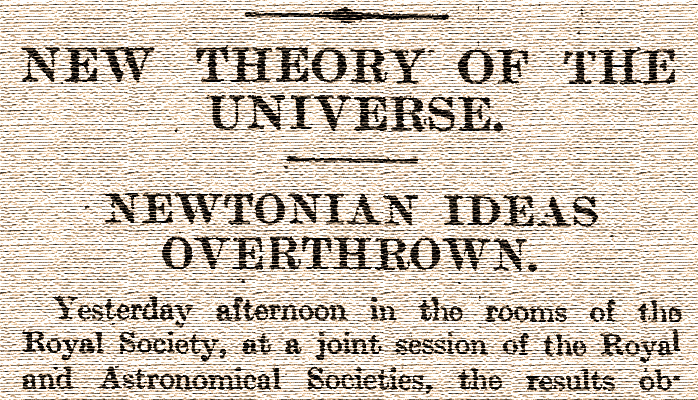 NEWTONIAN IDEAS OVERTHROWN.” The news travelled worldwide, and Einstein became famous overnight. Reflect on how a concept so little understood could become so famous. Your audience can empathise with the everyday meanings or implications of a scientific theory or technology, even without digesting all the related technical facts. In Einstein’s case, history was being rewritten and the stars seemed within reach. Lesson 3: Technical arguments aren’t always best, nor relevant. When I teach communication to engineers, I often come across an over-reliance on numerical data. This raises two problems: firstly, too many figures and graphs often cloud the conclusions of the author, and secondly, non-technical arguments can be just as important. Einstein creates a universe using the imperfection of our sensory perception. He preaches to us: All your perceptions are relative, therefore you must construct a relative universe following my recipe. That is nothing but the most unproductive scientific nihilism and in accordance with the political past of the professor, who belongs to political parties, which intend to relativise the national sense of honour … All Einsteinians with their comprehension-simulating Bolshevik-Zionist clique cannot deny the fact that time, space and matter exist infinitely and that, from a given centre, one can indeed develop an absolute world view. The most outstanding theoretic physicists—I will name H. A. Lorentz, M. Planck, Sommerfeld, Laue, Born, Larmor, Eddington, Debye, Langevin, Levi-Civita—are linked with the foundation of the theory and have contributed most valuable facts to the theory. As outspoken opponents of the Theory of Relativity, I would know only Lenard among the physicists of international importance. I admire Lenard as a master of experimental physics: in theoretical physics, however, he has accomplished nothing. In this post I’m certainly not advocating attacks on character, but my concluding appeal to technical professionals is this: broadening the tools of argument beyond the technical can deliver handsome returns in persuasion. Even Einstein did it.